1959 McCall's #4924 vintage sewing pattern, misses' two-piece dress, plus size 20. Two-piece dress has blouson jacket with wide boat neck and slim skirt. Flat collar and tie-ends in one. Jacket gathered into waistband. 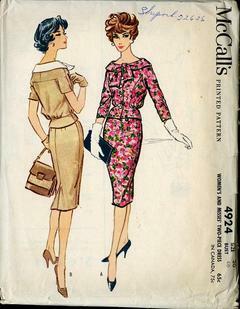 short or three-quarter length sleeves cut in one with jacket front and back yoke. Front, collar and waistband are interfaced with cambric or taffeta. Dart fitted skirt has back pleat, left side zipper placket, may be lined.